Formerly Kelly's Floral Design, Sweet Clover operates out of the quiet town of Finch, Ontario. Situated almost in the middle of the Cornwall and Ottawa areas, we service both for weddings and special events. We pride ourselves in being able to create something unique and custom to you for each occasion. Flowers are an emotional purchase and we understand that, and want to help you convey that emotion the best we can. Whether you are a new bride wanting to get your flowers just right, or are picking something out to memorialize a loved one, we will take the time to listen and understand your vision for your flowers and make it a reality. Everything made is done personally by owner and designer Kelly. We have also added a gifts that can be sent to that special someone when flowers aren't exactly what you are looking for. If you get the chance to come in you can see what you have available because it will always be changing and refreshing. Want to see what Brides have been saying about Sweet Clover? Always loving to be creative and working with my hands I started off with the Horticulture Technician course at Algonquin with the aspiration of making beautiful gardens. However, I was later intrigued by the florist program taking place in the same building so decided to enroll upon my completion of Horticulture. This is where I found my true passion. 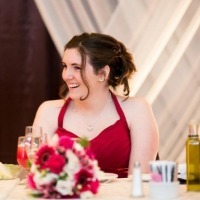 Having worked in several shops since 2007, in both Ottawa and Cornwall, I have been able to try my hand at a wide variety of floral design and started doing wedding and event work on my own in 2010. I love taking an idea and pulling together different elements to create something wonderful and unique. My greatest love is wedding bouquets and the attention to detail that they require. I enjoy talking with brides and trying to take what they are describing, even if it is just a vague idea, and making it into a reality. I take great pride in creating personalized work for each individual and delivering their vision, and doing so within budget. My goal is to work as a team, to be sure that what I create will make everyone very happy.I now have the chance to interact with more of the community that I live in and grew up in. I am now able to accommodate a larger variety of clients with my full service shop. I am excited to help you find that right thing to send to memorialize someone or express your sympathy, or something to celebrate an anniversary, birthday, or new baby. *Fun fact about our name change, the decision to use Clover is inspired by my two kids, Chloe and Oliver. © Copyright 2016 Sweet Clover Flowers and Gifts. All Rights Reserved. Built with Volusion.